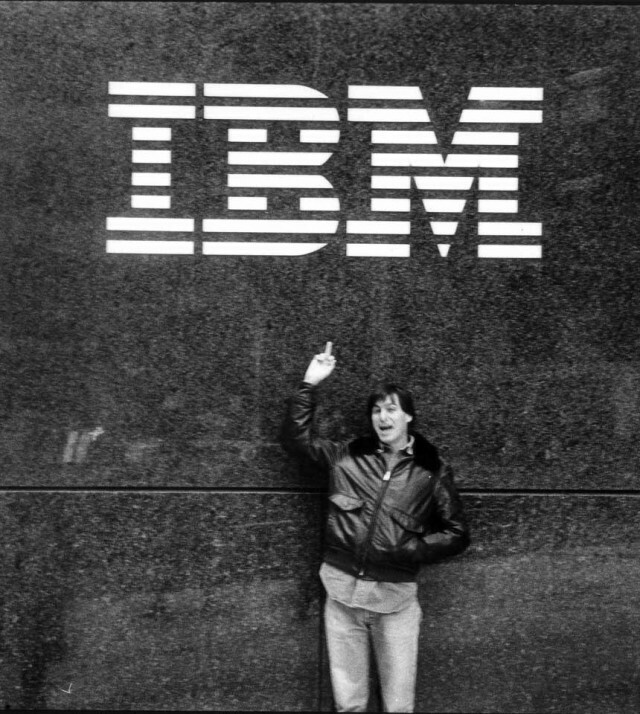 At one time, an Apple and IBM deal sounded impossible. October 2, 1991: As the Cold War comes to an end, hell freezes over a second time as Apple and IBM agree to put aside their differences. Apple and IBM’s rivalry kicked off in a big way with the launch of the IBM Personal Computer in August 1981. Despite welcoming IBM to the personal computing party in the pages of The Wall Street Journal, it didn’t take long for Apple to position Big Blue as public enemy No. 1. The biggest reason for this was IBM’s success in the business market, which Apple desperately wanted to crack. IBM possessed the type of name recognition that Cupertino was still busy cultivating. The most obvious shot that Apple took at IBM was with its 1984 Macintosh commercial, directed by Ridley Scott, which cast IBM in the role of Big Brother. By the early 1990s, however, it was clear to Apple that Microsoft presented a bigger threat than IBM did. Sculley also came around to the fact that Apple’s major source of value was its software, not its hardware. In April 1991, he gave a demo to IBM engineers showing an Apple OS running on an IBM PS/2 Model 7 PC. This led to the October deal, in which IBM and Apple agreed to work together. IBM was going to help Apple finish its “Pink” operating system (the one Apple engineers had created to run on IBM’s computers), as well as giving Apple a license to use its PowerPC processor. The switch from Motorola 68000 processors to PowerPC was one of only two times Apple would change its chip provider. The next time was when Steve Jobs oversaw the transition to Intel chips in 2005. “Pink,” meanwhile, became Taligent (a combination of “talent” and “intelligent”). This object-oriented operating system would have taken on NeXTSTEP, the similar OS that Jobs was building at NeXT. It ultimately stalled, however, and Apple pulled out of the deal in 1995. Apple went on to develop the similarly ill-fated Copland operating system. When that also bombed, Cupertino made the decision to buy NeXTSTEP — which resulted in Jobs’ return to the company he helped found. Today, Apple’s battle with IBM is a thing of the past. The two frequently collaborate on enterprise applications. Even Apple’s battle with Microsoft seems a bit retro, eclipsed by today’s biggest tech faceoffs between Apple and Google or Apple and Samsung. Still, the Apple-IBM deal certainly shocked the hell out of Apple fans in 1991. Were you an Apple follower at the time? Leave your comments below.